I really liked this book. I had read a sample of this book a while ago from Amazon. I was so interested, but since I read so many books, I’m kind of a cheap-o. Enter my library! I was so excited when I saw they had this book. I read it while on lunch break at work, & I felt like it’s another book that was going to cost me my job, since I had a hard time stopping reading & getting back to working! So it’s safe to say that I loved this book. The minute I finished the last page, I checked out my library website to see if they had book 2. They did not, so I immediately ordered a paperback copy from Amazon. I just can’t wait to see where this story goes! Anyway, the basics: nearly everyone has an Intestinal Parasite (TM) that keeps them healthy. Sally, the main character is in a car accident, and her tapeworm saves her life. She’s monitored regularly by the company that created the tapeworm. She’s torn between hating them, & being grateful. Seeing Sally deal with all of this is super interesting. I loved it. 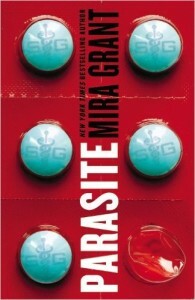 Share the post "My tapeworm tells me what to do"
I’ve been staying away from Mira Grant, because while I really do love Seanan McGuire’s urban fantasy stuff, I have this weird unreasonable prejudice. I’m not even sure where it comes from TBH. I enjoyed Rolling in the Deep though, so maybe I ought to give the Mira Grant alias a chance. Maybe?